Don't Buy Rouhani's Charm Offensive, Israel's Netanyahu Tells U.N. : The Two-Way Iran's President Hassan Rouhani is trying to use charm to ease international pressure without scaling back its nuclear efforts, Israeli leader Benjamin Netanyahu says. 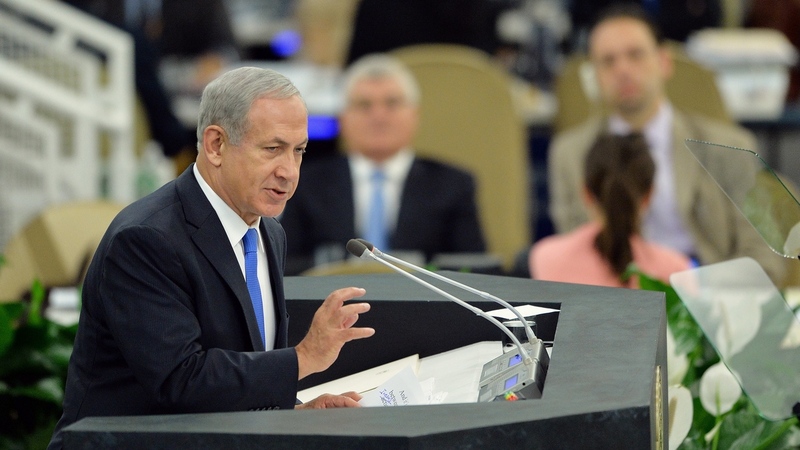 "Rouhani thinks he can have his yellowcake and eat it too," Netanyahu told the U.N. General Assembly Tuesday. Israel's Prime Minister Benjamin Netanyahu told officials at the U.N. General Assembly Tuesday that it's too early to ease sanctions on Iran, urging them not to be fooled by what he called a charm offensive by President Hasan Rouhani. Israeli Prime Minister Benjamin Netanyahu took aim at Iran and its new president, Hasan Rouhani, in a speech at the United Nations Tuesday, saying that Iran is trying to fool the international community into easing sanctions on it, even as the country expands its nuclear program. "Rouhani thinks he can have his yellowcake and eat it too," Netanyahu told the U.N. General Assembly, referring to yellowcake uranium, a concentrated form of the radioactive element. The Israeli leader spoke one week after Rouhani's U.S. visit, which included a speech at the U.N. and a telephone chat with President Obama — the first conversation between the two countries' leaders since the 1970s. News had previously emerged that the pair had exchanged letters. In his speech, Netanyahu accused Iran's leader of engaging in a charm offensive that is meant to take international pressure off his country without making tangible concessions over its nuclear program. "I mean, this is a ruse; it's a ploy," he said. Netanyahu listed elements of what he called Rouhani's strategy. "First, smile a lot. Smiling never hurts," he said. "Second, pay lip service to peace, democracy, and tolerance." He continued by saying Rouhani is offering "meaningless concessions" to have sanctions lifted, all while ensuring that Iran can continue its nuclear program. Iran has long insisted on its right to pursue the program, saying that its goal is to produce nuclear energy. "Ladies and gentlemen, I wish I could believe Rouhani. But I don't," Netanyahu said. "Because facts are stubborn things." In his speech, the Israeli leader said that in Rouhani's previous roles in Iran's government during the 1980s and '90s, he was in a position to know about deadly international attacks that targeted Jews and Americans. "Rouhani stood at this very podium last week and praised Iranian democracy," Netanyuahu said. "But the regime he represents executes dissidents by the hundreds, and jails them by the thousands." Saying that Iran has enriched uranium and acquired advanced centrifuges for its nuclear program, Netanyahu asked, "Why would a country with vast natural energy reserves invest billions in developing nuclear energy?" "Iran is not building a peaceful nuclear program," he told the delegates and leaders in the U.N. chamber. "Iran is developing nuclear weapons." The speech follows Netanyahu's visit to the White House Monday, when discussions centered on Iran, Syria and efforts to reach a peace agreement with the Palestinians. Netanyahu said he urged President Obama to maintain and even tighten sanctions on Iran. During his American trip, Netanyahu has said that before the sanctions are lifted, Iran's words must be matched by actions that satisfy the international community. He listed some of his requirements Tuesday, saying that Iran must cease to enrich uranium and remove its stockpiles of the material. As NPR's Parallels blog has noted, the U.S.-Iranian relationship has previously experienced "bouts of optimism" — only to return to a stalemate. And while experts voice skepticism over the recent moderation of Iran's tone, they also note that Rouhani has the support of Iranian Supreme Leader Ayatollah Ali Khamenei.